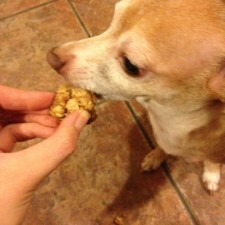 In honor of peanut butter lover’s day, I just had to share a treat that’s enjoyable for both pets and humans. Who doesn’t love peanut butter?! The average adult consumes close to 3 pounds of peanut butter per year – whoa! Adding peanuts into your diet will help serve as a source of protein, vitamin E and folate. When looking at smooth or crunchy peanut butter, I personally like a crunch. These peanut butter clusters give both a crunch with a little bit of smoothness, so you’ll actually get the best of both. Mix all ingredients together until you reach a cookie dough consistency. Next, roll the dough into round clusters, about 2-3 inches in height. Spray a cookie sheet with Kelapo Coconut Oil Cooking Spray and place clusters evenly throughout the sheet. Bake for about 15 minutes, let cool and enjoy! Make sure to really watch these clusters when baking – if left in the oven for too long, they do dry out. Since coconut oil is naturally gluten-free, you can also choose to use gluten-free oats to tweak this recipe for those who should avoid gluten. 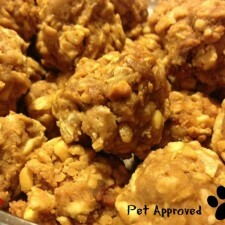 My pup went absolutely crazy for these peanut butter clusters and I sure did, too! These actually freeze really well and can be thawed out or given to the animals frozen if it’s a hot summer day. If making these for just yourself, feel free to add in dark chocolate chips, almonds, or raisins to spice things up a little bit. For more peanut butter recipes, check out my Peanut Butter Blossoms, Peanut Butter and Jelly Bars, or Michelle’s Frozen Chocolate Peanut Butter Bananas. 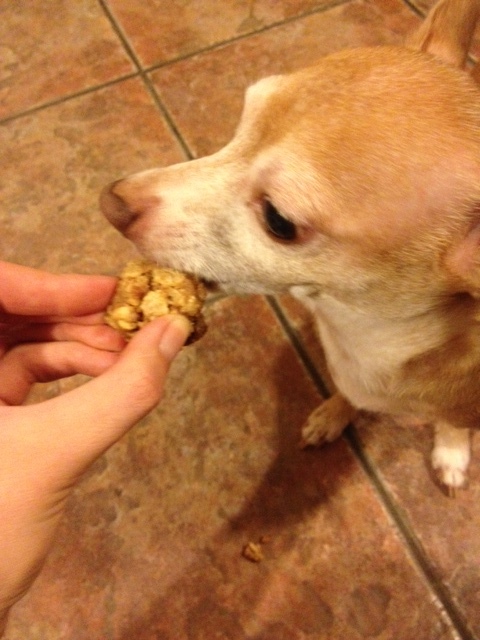 I’m also a big advocate for giving my pup coconut oil for added health benefits and even making my own dog food. 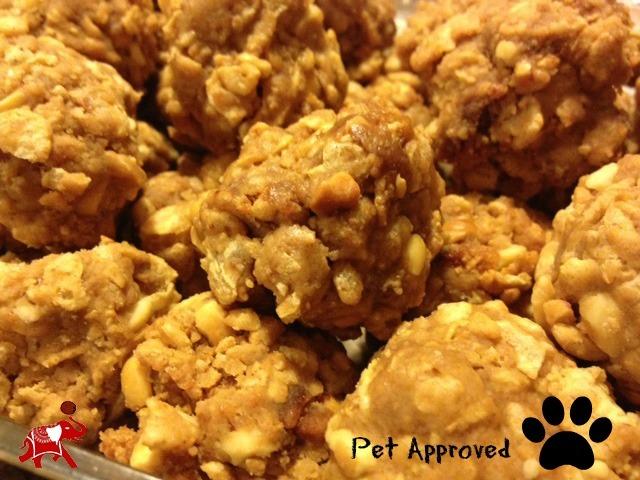 Sometimes knowing exactly what ingredients your dog is getting is best. Visit our Top 5 Uses for Coconut Oil and Pets for more information. We did this recipe at 350 degrees F.